Our 2017 warbird pylon racing season kicked off to a great start on Saturday. The guys did an awesome job of rolling with it and working out a smooth process for conducting the heat races (including how to do hand-launches). The races were fast, nail-biting fun! The new Tower Hobbies Reno Racer Mustang proved to be the plane to beat (although much of that performance was definitely superior piloting skill). After three heats of races (6 total), Mark. M. came out with an early points lead in the season. Will he remain the points lead? The stakes are high- we'll see next month! Click HERE for the current points standing. It is not too late to join the racing series. If you have a Tower Hobbies war bird, bring it out and join the fun next month! The cold, wet, and windy weather has put a damper on plans to have pylon racing practice (or just flying models in general). We have standing water in the pits, and pylon practice was put off again today because of the 15 mph wind gusts. The quadcopter handled the wind well. 1980's Great Planes Trainer 60 with a Saito 65. Despite the recent weather, the flying season is here. 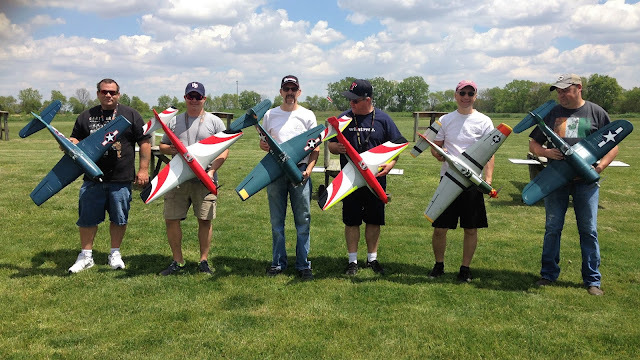 Looking for a friendly place to fly, or learn to fly model aircraft? Fill out the CONTACT US form on the JOIN page and we'll get you set up with an association membership!